Gucci offers their loyal patrons a chance to receive a free high end gift! 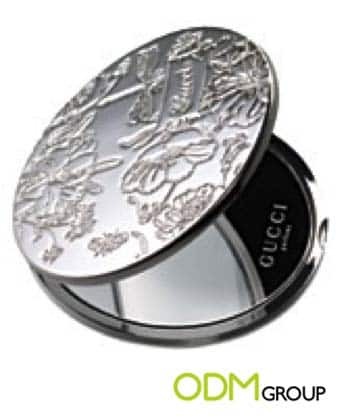 Customers purchase any of the selected Gucci fragrances at Sephora, then the customer receives a silver-toned flora mirror. This luxurious 2.75” diameter mirror boasts intricate floral designs. The brand gives the promo gift an alluring and luxurious feel that customers appreciate. Customers love the idea of getting a luxurious item for free. Also, Gucci effectively promotes the brand by printing its trademark Gucci logo on the mirror. As an added exclusivity, this promotion has limited number of stocks on Sephora online store. Hence, customers would do anything just to get their hands on this luxury. Take a look at the exquisite high end gift mirror that Gucci offers. Guccio Gucci, also known as Gucci, is an Italian fashion and leather goods brand and is the biggest-selling Italian brand in the world. From humble beginnings at the end of the 19th century, Gucci has worked its way to become one of the world’s most successful manufacturers of high-end goods and apparel and have made a name for itself in the global marketplace. Overall, anything from a top brand means quality and excellent. Boost Your Sales By Offering a high end gift! The limited edition mirror that Gucci offers is unique and different from what is seen from the usual. This helps the brand stand out from its competitors. Because clearly, the exquisite design of this marketing giveaway is the focal point of this promotional compact mirror. Furthermore, limited edition gifts easily generate purchases from consumers. Therefore, these kinds of marketing gifts will surely take the market by storm. Why Do We Love This High end Gift From Gucci? Functional – Even if it looks very pretty, we can’t take away the fact that this is still a working and functional mirror. Well, it’s not just a mirror, it’s a Gucci mirror! Brand Promotion – When people receive this kind of high end gift, of course, they’ll use it. They want to be seen using something from a luxurious brand. Therefore, the more people use this, the more people notice the brand. In conclusion, the mirror is an excellent promotional gift in terms of functionality as everyone uses it. It is especially useful for the ladies who love to have a pretty mirror in their handbags. This could be a big part of their custom cosmetic pouch. Lastly, this promotional gift is durable and long-lasting. Hence, consumers can reuse it over and over again. This increases its perceived value, making it more attractive. If you want to run your own free mirror campaign, feel free to contact ODM anytime. The ODM team is always ready to answer your queries that relate to marketing and manufacturing.